As much as I joke about “becoming one with the marmots” when I’ve been working with in the field for months on end, I don’t actually identify most of the individuals by looks alone. An exception to that general rule was “3”, so called because of the mark we put on her back. This particular marmot lives in Gothic itself (the specific location of the RMBL and the site we call Town). Posing alertly by one of the cow skulls commonly decorating the cabins at RMBL (All photos: Tina W. Wey). Choosing a comfortable spot to nurse her pups. Perhaps it’s her rich dark gray/brown fur and prominent white nose bar. Perhaps it’s her curious gaze and prominent buck teeth that are always poking out. Or perhaps it’s her “special” behavior and affinity for the cabins (she once decided to wander right in through an open door and check one out for herself, much to the shock of the researcher inside). For whatever reason, I find her a real charmer. 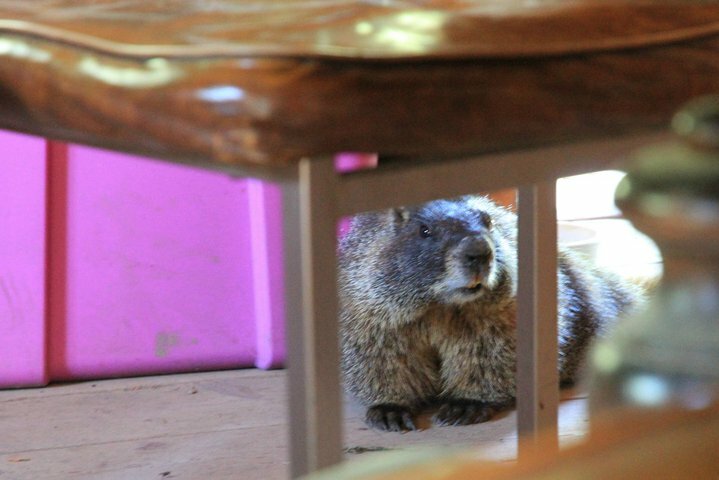 Fat, fluffy, and curious – yes, she's quite the marmot about Town! Looking fat and fluffy even in the spring. Actually, that's mostly fur, as the marmots are usually very thin when they first emerge and spend the summer packing on the pounds for the coming winter. Late summer, looking about ready to roll off the cabin steps! Now she probably is as round as she looks. 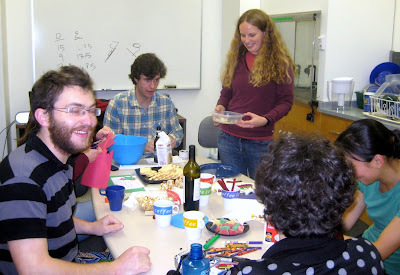 My name is Raquel Monclús (the one under the hat) and I am a post-doctoral fellow. I did my doctoral thesis in Spain studying European rabbits. I looked at how the rabbits respond to their predators. 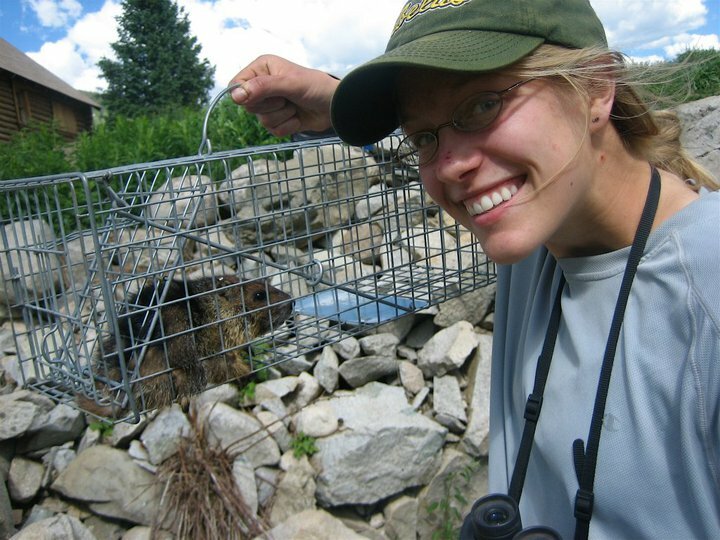 I got my doctor title in 2007 and then I got a Fulbright post-doctoral fellowship to come to study marmots, and in particular to study the indirect effects of predators. Marmots, and most animals, have strategies to avoid (or at least try) being eaten. For instance, they regularly scan the environment to detect the presence of risky situations, and as they are alert they can act fast whenever their risk increases. However, being alert makes that some animals might have to reduce the time that they are feeding, so they cannot gain as much weight as those with fewer predators. And for marmots weight is essential if they have to spend 7 months under a huge cover of snow. But why did I come all of the way from Spain to study marmots in Colorado? Because they are a great study system. 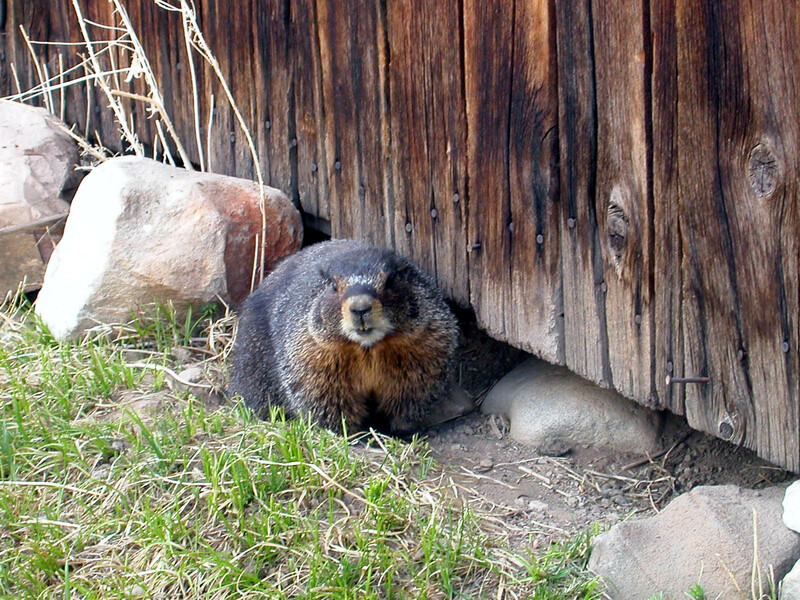 Marmots live in groups; therefore, many individuals live in the same spot. They are diurnal, so one can easily observe many of them at the same time and they have different predators so not all of them face the same threats. 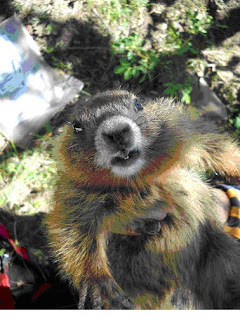 There are marmots in many places, including Spain, but these marmots, the ones we are studying, are special: they have been studied for nearly 50 years. 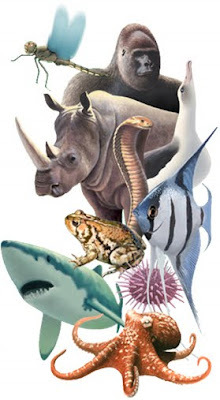 So we have a deep knowledge of many aspects of their biology and ecology and it is just now when we can start answering interesting ecological questions about patterns, trends and dynamics. However, we will need another 50 years or so to know everything about marmots… We will try. It's a bit hard to make out in the picture above, but it's there, a running marmot. The marmot is indeed being chased by a researcher, this is literally science in action. 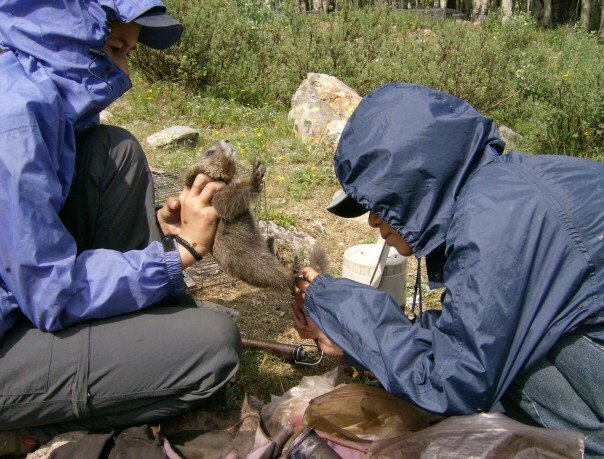 So why are we chasing marmots? Well, we are measuring how fast they run. 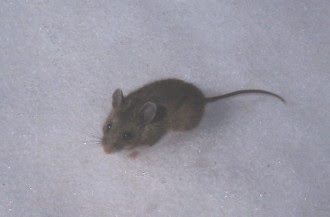 Research in our lab focuses on antipredator behavior, and running speed is therefore a trait of interest. 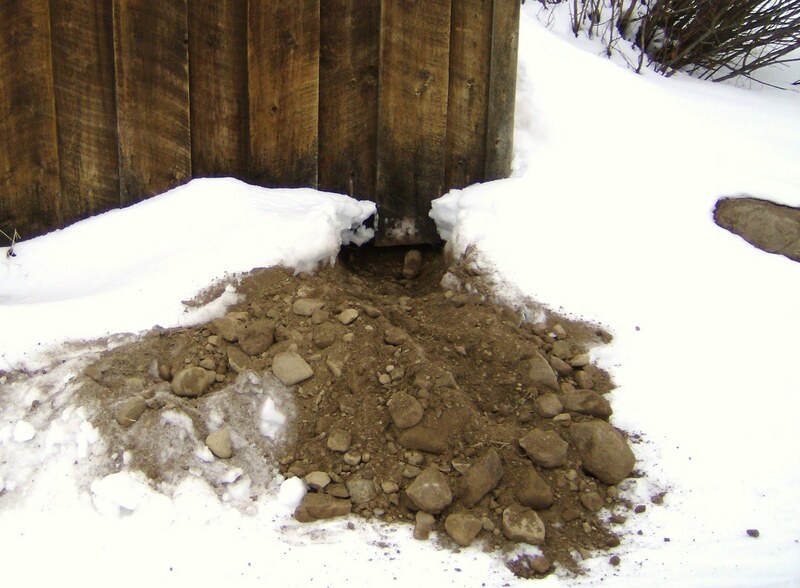 Antipredator behavior simply refers to marmots' strategies for escaping or avoiding other animals that want to eat them. So, an animal's ability to quickly accelerate and outrun a predator is extremely important. 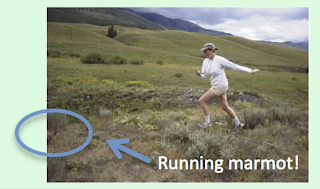 To measure running speed, we chase marmots and time them over a fixed distance. We also note things like incline, substrate (grass, rock, sand, etc. ), and vegetation height, as these variables may influence the marmot's speed. As we chase them, we yell, shout, and sometimes flail our limbs to scare them. 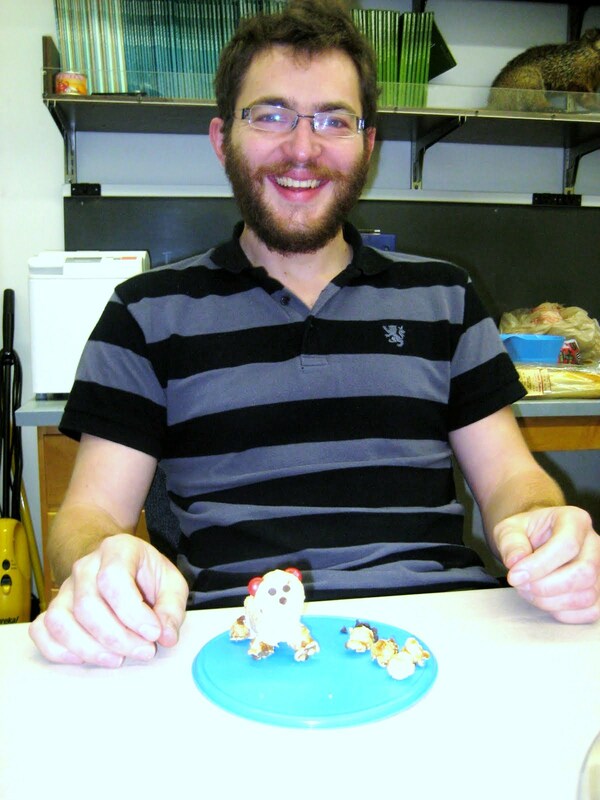 Each researcher has their own particular call (see title for some examples), but I am a particular fan of "run marmot run". Though it seems silly, it is necessary to mimic an intense predation situation so that marmots run as fast as they can. Remember your P.E. class? Every week you were required to run a lap around the track while your teacher timed you. Now imagine a giant was chasing you while screaming and waving his arms. I bet you'd run a little faster, right? We're interested in MAXIMUM running speed, not jogging speed or leisurely stroll speed. So the chasing and hollering is indeed necessary for accurate data collection. Plus, it's hilarious to watch your colleague, professor, or field assistant try to outrun a marmot. I am a new postdoctoral fellow in the lab. I am interested in the impact of climate changes on the evolution of traits of yellow-bellied marmots. I have done my M.S. on personality in wild chipmunks under the supervision of Pr. Denis Réale. 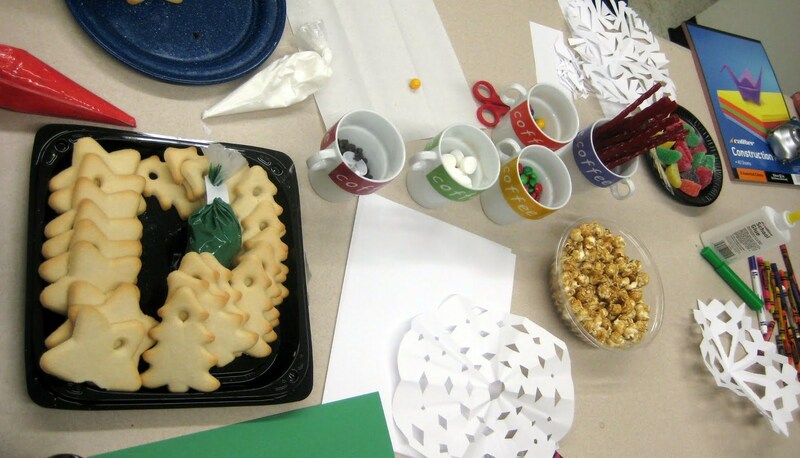 My main interest was to establish if individuals differed in their behavior in a stressful situation and how these differences were related to hormones and human disturbance. For my PhD, I worked on reproductive strategies of bighorn sheep females with Pr. Marco Festa-Bianchet. 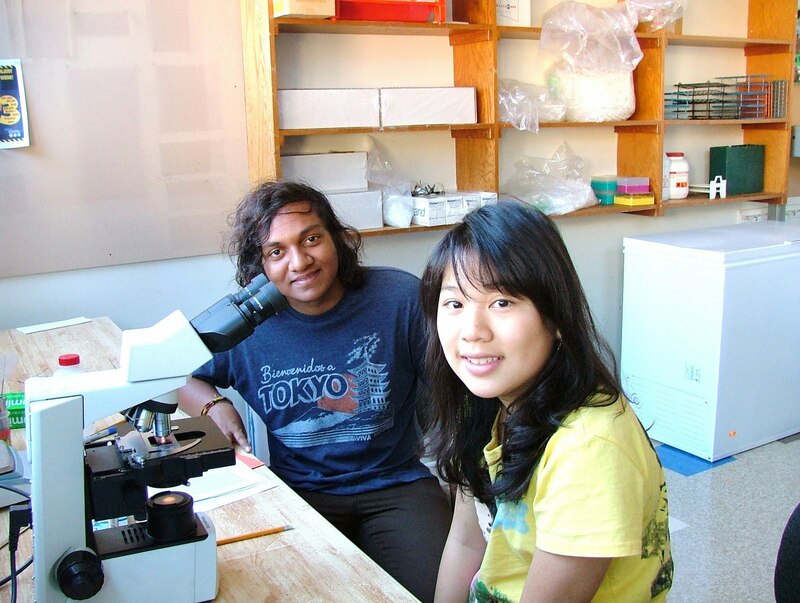 I was interested in how adult females allocate energy to reproduction or to survival under different conditions. 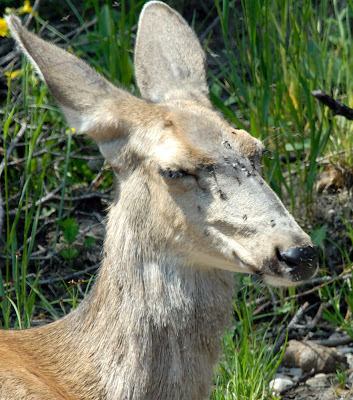 In few words, bighorn females always favor their own body condition and survival over the ones of their lambs. Photo taken by Alice Branbilla. Because I have not yet done any field work at RMBL, I do not have any photos with me and a cute marmot. 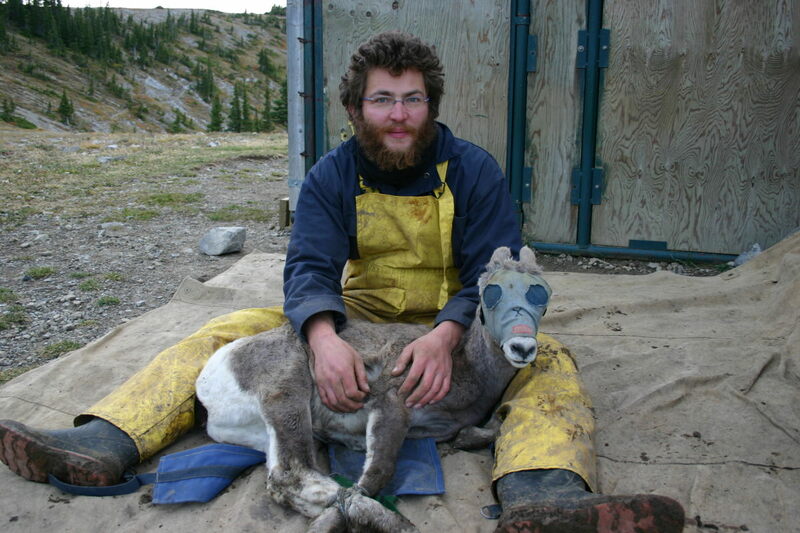 However, here is a picture of with a male bighorn lamb of 4 months back when I still had a beard (--luckily lambs grow much faster than does facial hair). Mid- to late July is my least favorite time of year at RMBL. It’s hot and dusty, there are tons of tourists, we’re super busy with pup trapping…and there are the biting flies. Numerous, relentless, buzzing, biting, blood-sucking…can you tell I’m not a fan? The flies are at best annoying and at worst give lots of painful bites that result in excruciatingly itchy bumps and to which I have rather extreme allergic reactions. 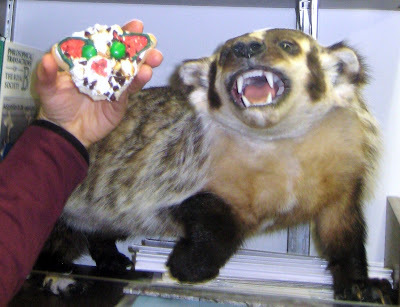 Parasites can have a big effect on host behaviors, and needless to say, I go to great lengths to try and avoid their bites. And while some strategies are more successful than others, all result in rather amusing (in retrospect) behaviors. 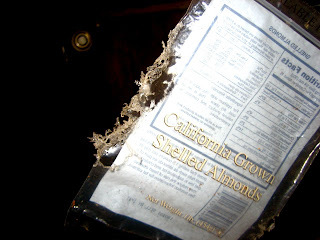 Some of my emergent behaviors are simply a reaction to the flies in the moment. For example, sometimes I’ll endure the flies for a while, and then suddenly freak out and do a crazy dance, which involves a lot of hopping around and wildly waving arms and erratic slapping motions. Also, I am normally a rather slow jogger, but during fly season, my pace quickens drastically in a desperate attempt to outrun the flies (they consistently catch up to me if I let myself fall into to my usual, comfortable slow pace). If I had to deal with flies all the time, I’d have to either quit jogging or get a whole lot faster. 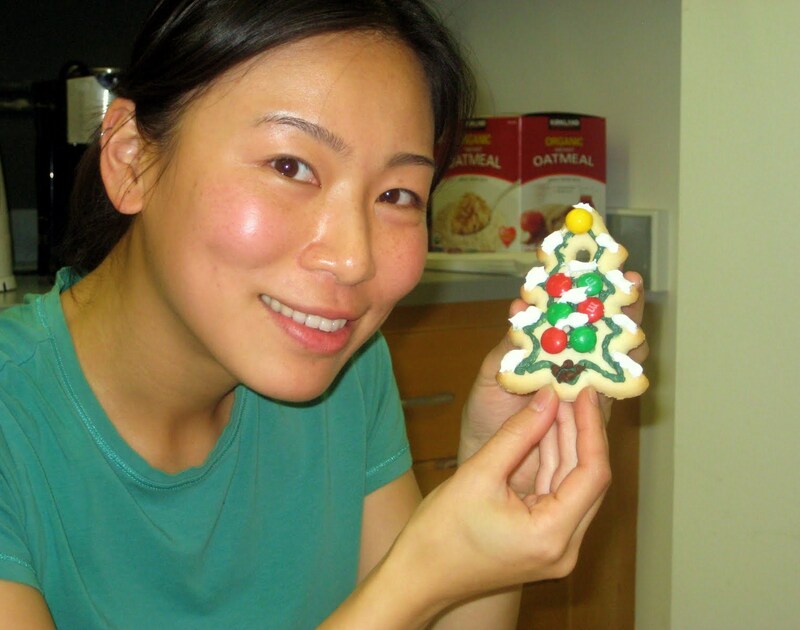 My name is Kelley Lu and I am an undergraduate student. When I’m in the lab, I count the number of neutrophils, lymphocytes, monocytes, eosinophils, basophils, and trypanosomes in the blood slides that the marmot team retrieved from marmots on site. I count the number of each type of cell until I reach a 100 sum between the neutrophils and lymphocytes. 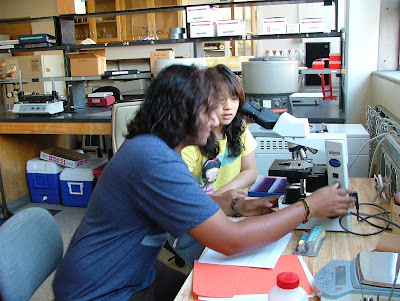 One of the difficulties I encounter when I’m working is the “unknown cell”. Occasionally, I will bump into a cell that I can’t identify—it looks like a neutrophil, but it also looks like an eosinophil… or sometimes a lymphocyte-looking cell that looks like a monocyte. 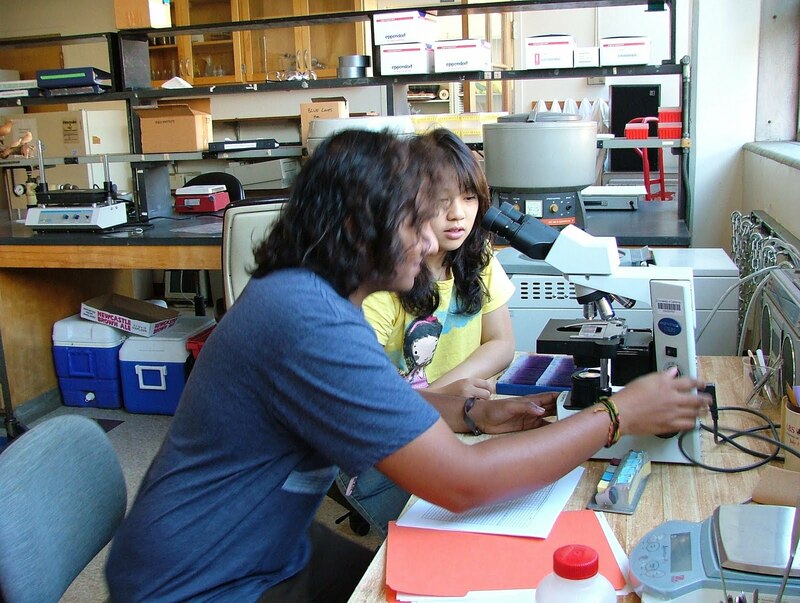 Other times, the slide will have too many cells, and such a thick layer that I can’t discern between the different types of cells, or the slide will have too few cells, and there won’t be enough cells to count. 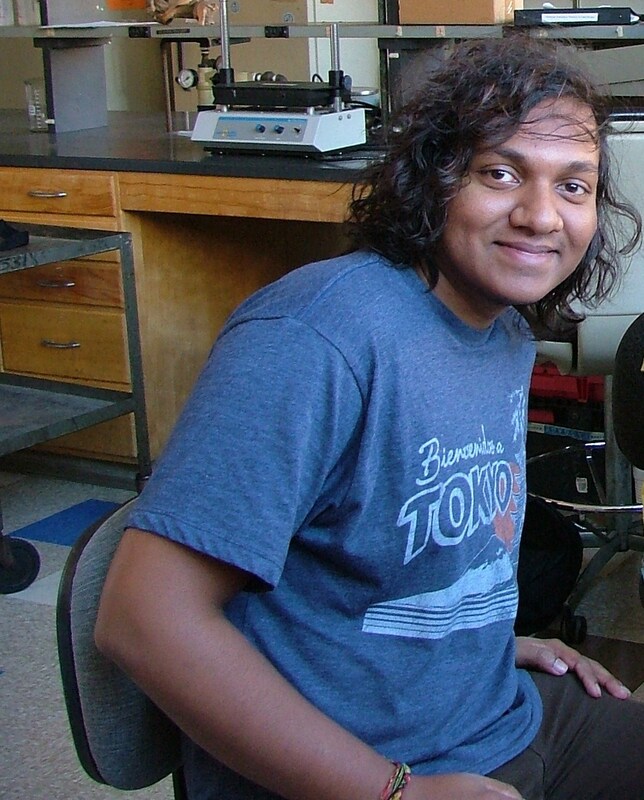 My favorite part of working in the lab is clicking the counter, because I love the sound it makes when it clicks. It’s also a small triumph every time I click the counter, because each “click” simply means I’m one cell count closer to reaching the 100 sum for the neutrophils and lymphocytes. The University of Michigan Museum has lots of interesting information on animals of all shapes and sizes. 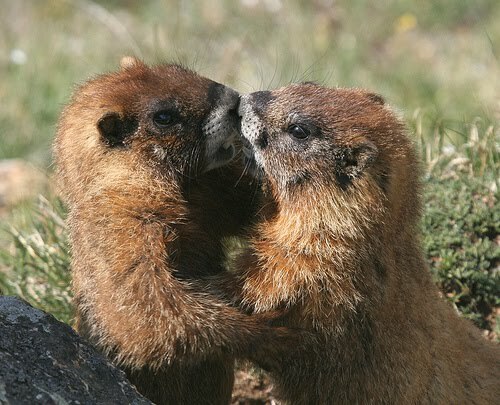 Check out the fun facts and interesting photos of yellow-bellied marmots at Animal Diversity Web. I study marmots with my dad. Marmots are brown furry mammals. 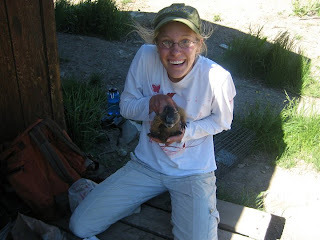 I study marmots in Colorado. When I study marmots I try to see how loud they get. The loudest marmot I have heard is 120 db from 2m. 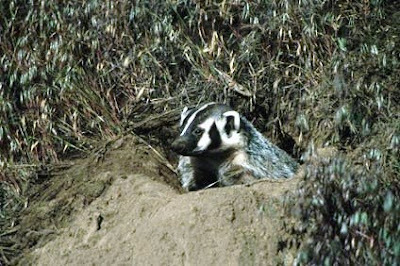 I want to see how loud they get because than I can find out if a predator is around their burrow or them. Where I study marmots the most successful predator is the fox. When marmots get scared they make a loud screaming sound called alarm calling. If you studied marmots you would take notes I take notes and always record data. We use large metal live traps. When the marmots get trapped normally they get scared. We use traps because we can’t catch them otherwise they are too fast. 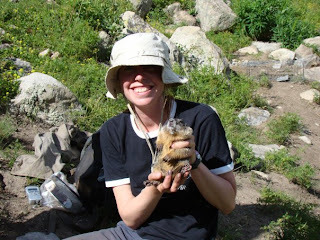 This is me holding a marmot.